The weekend is quickly approaching and I couldn't be happier. This has certainly been one of my busiest weeks, with three papers being due and a group project to present. I can't wait to lay back and relax, at least for a few hours this weekend. I have so many plans like a St. Patrick's Day party, and going to Indian Town and possibly doing some yoga and meditation. I can't believe it's only been five days since I got back to school after Spring break, it feels like I never left. There is so much excitement in the air with me and my friends looking at houses to live in for next year. It's hard to believe that I may be leaving York after this summer to live/work/go to school in Philadelphia year long if things work out like they're supposed to. This is a transition I thought would come much later in my school career but I'm realizing that I think I'm ready for this now. I wore this outfit all the way back during Winter break, I'm assuming it was a warmer day than usual since I'm not wearing a huge coat. This season I am really loving light denim, especially light denim tops. I paired this with a light grey striped scarf and a dark red beanie to contrast from the light colors. Even if these "Sold" jeans are getting a loose on me, they will always be my favorite. Once I'm working this summer I would love to be able to save up for another pair, they are so comfortable. So, what are your weekend plans? It definitely sounds like you've been busy! Be sure to relax and have fun this weekend! 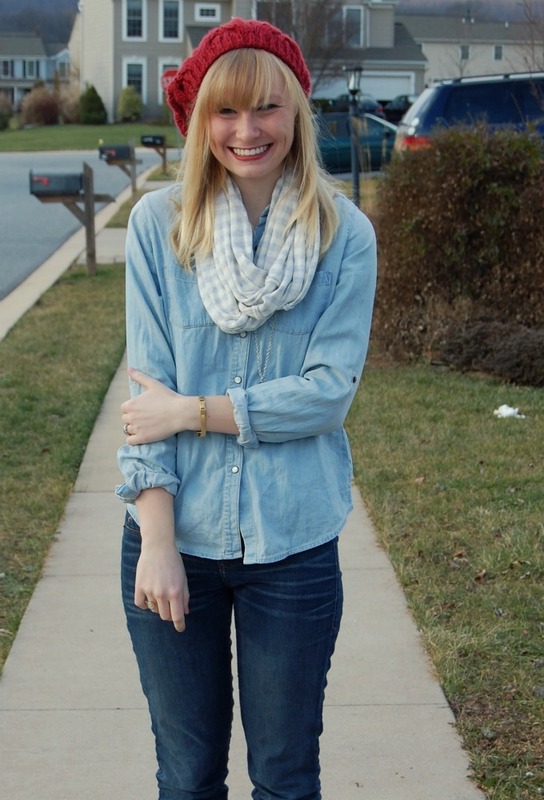 Love this outfit, especially that denim top! You look amazing! Just the right amount of feminine and edgy. And that shade lipstick looks great on you. We are going to Winter Park this weekend for some R&R. Good luck on your house hunt! 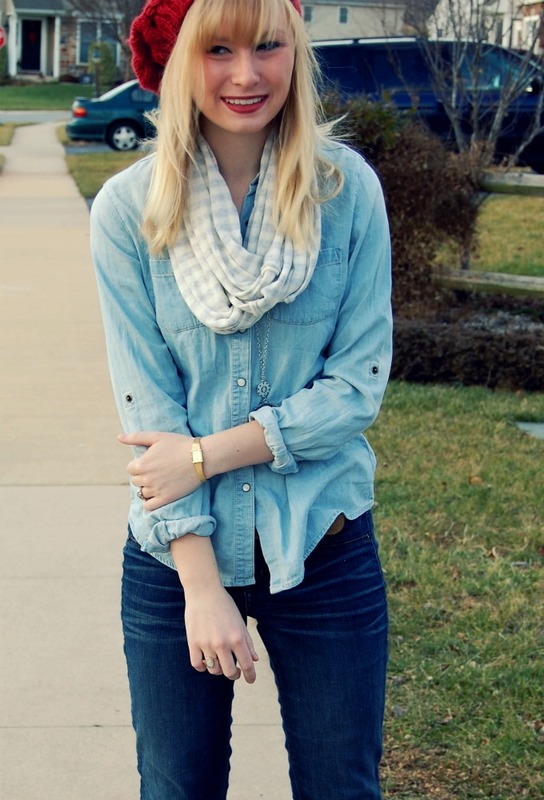 Love the striped scarf and your denim on denim. love the boots and beanie!! Love the pop of color to this otherwise muted ensemble...bold dash of red heightens any ensemble to super chic status! Great mix! so great look!! love your denim outfit! Cute outfit..I like the jeans! Good luck with finding a place. Exciting times! I love your blog. your style and vibe are great. would love it if youd check mine out and follow me back if you like! Thanks! This outfit is so cute! I'm loving your blog, especially the heart print shorts in your header! Where are they from? I love that denim shirt! I looks great on you! 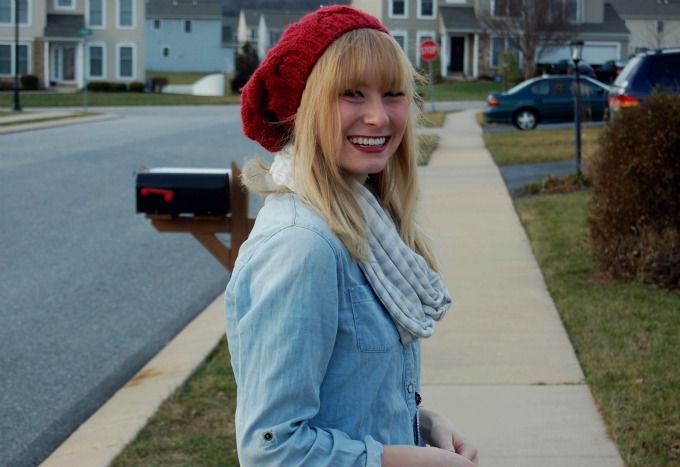 :) And your beanie is adorable! I love your boots! And the denim on denim is quickly becoming one of my favourite trends. It feels kind of nostalgic for some reason. You are too cute! I love all the pieces of this outfit, but especially your boots. Love your outfit! The leather and denim look awesome. This outfit looks super cute on you! I love how you paired the lighter and darker denim! 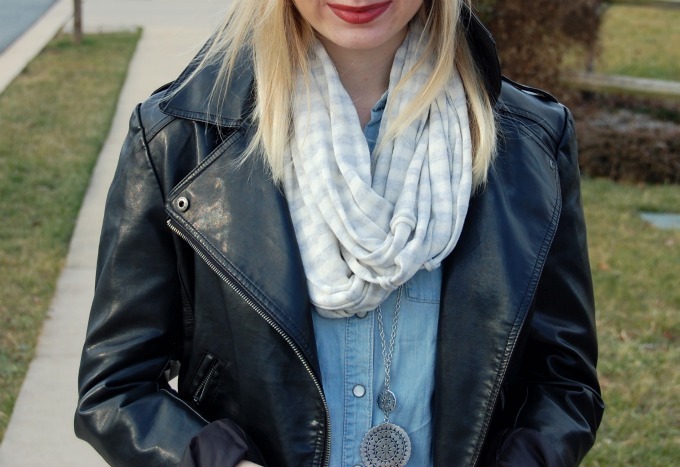 Your hat gives the outfit a pop of color and your boots give it a bit of edge!